Liberty Square remains the Magic Kingdom's most successful area beyond the upper edge of Main Street; it's as small and effortless as it is accomplished and rich. It's as intimate as Magic Kingdom gets, and anchors three of her best attractions. In terms of landmass, it's small, but in terms of artistry, it's large. Which is why you really, really need the musical background here to be appropriate. I'd argue that Adventureland, Fantasyland and Tomorrowland can support a wide variety of music styles because they're themed to attitudes and ideas, not places. 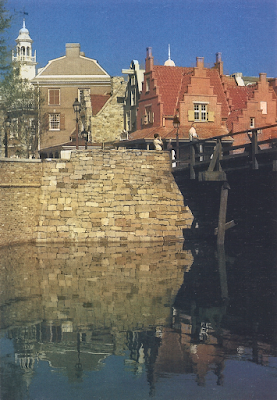 But when you get to Main Street, Frontierland, and Liberty Square, you have to be very careful. People already have an idea of what those areas could feel and sound like, and the key is to meet these expectations while harmonizing with the architecture and the overall message of the area. It's trickier than you think. Liberty Square is special to me, so for the next few weeks we'll be taking a close look at the music of Liberty Square. Anyone who collects park music has likely come across a scratchy piece of fife and drum music with odd fades in and out which purports to be the very original Liberty Square music. From most perspectives, this file is chock-a-block with problems. The music quality is poor, there's weird fades, and worst of all, it's only 12 minutes long. And this from a subset of the community which is no stranger to mislabeling, subterfuge, and just plain lying. No way this is authentic, right? Wrong! The original Liberty Square music comes to us from the collection of Mike Cozart, who beat all of us to the punch by getting friendly with Jack Wagner before he died. Many of the early, difficult to verify music loops which circulate in the collector community, such as the original Adventureland Veranda and King Stefan's Banquet Hall loops, come from Mike, who got them direct from Jack. Michael Sweeney has identified most of the tracks in the digital file version of this music reel as we have it today. 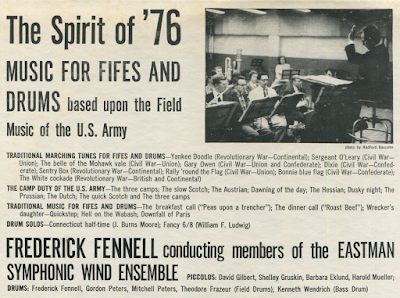 Most of them come from a 1957 Eastman Wind Ensemble Record "Spirit of '76". Please note that the version which was used to create our music loop in question was the LP version. 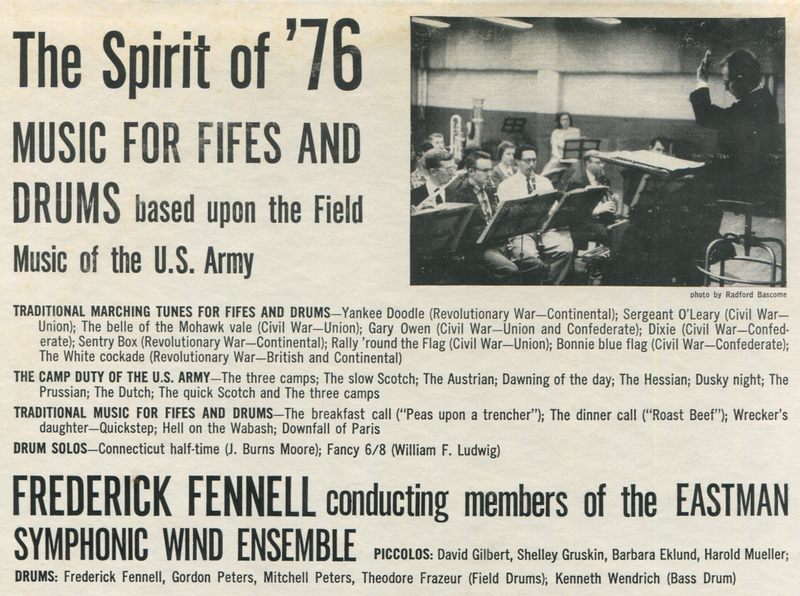 The same music is available most commonly today via a 1997 CD which compiles "Spirit of '76" as well as another Eastman Wind Ensemble record, "Ruffles and Flourishes". This CD version breaks up the running order of the tracks a bit and obscures some of the choices Jack made in 1971. Tracks 11 - 13 in this list come from a as yet unknown source. Given the rest all come from a same LP - and appear basically in album order - may seem rudimentary, but is characteristic of other very early Wagner-era music loops. Okay, okay, I'd better say something before the more ardent BGM fans out there start throwing things at the computer screen: this list, and the photo provided of the reel above, don't match up. The reel clearly indicates a run time of 14:40. And then below the 14:40 on the identification sticker in Jack's handwriting, it says "19:10", which isn't correct either. This loop has three different run times, and none of them make any sense!! Okay, relax, let's put on our detective cap here and go through this one problem at a time. The loop as we have it comes out to around an even twelve minutes. Thanks to Jack's notation on the reel above, we know that the full length was intended to be 14:40. So where did the missing 2 minutes and 40 seconds go to? What is evident when you're looking at the original LP instead of the somewhat misleading CD version, is that Jack drew from a very specific set of tracks to create the loop. Each side of the Eastman Wind LP is divided into two suites. 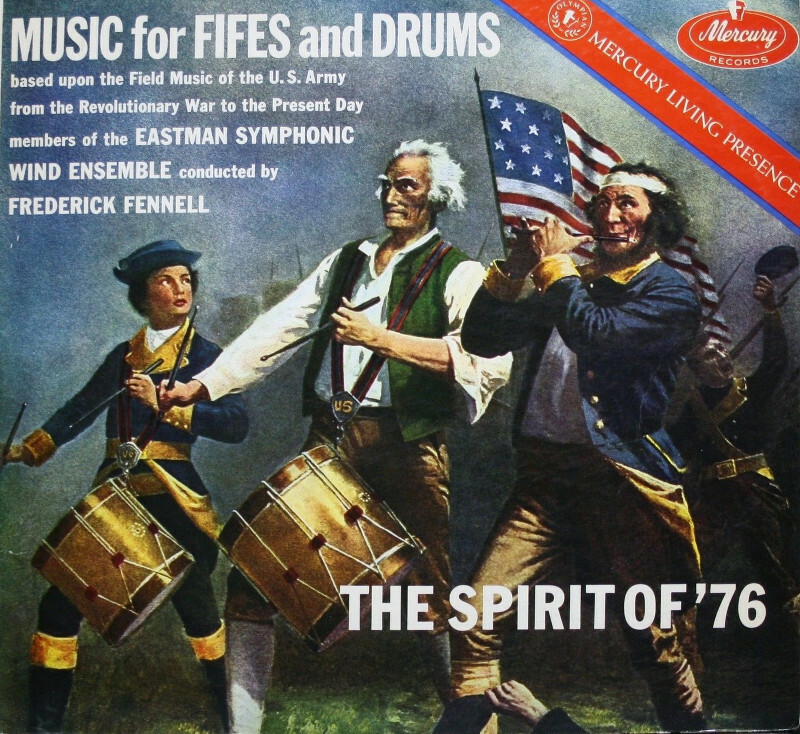 Side A includes "Traditional Marching Tunes for Fife and Drum" and "Camp Duty of the US Amy", and Side B contains "Traditional Music for Fife and Drums" and "Drum Solos". He uses the entirety of Side A's "Traditional Marching Tunes" and one Track from Side B's "Traditional Music for Fife and Drums". He doesn't use anything from "Camp Duty" or "Drum Solos". Why? It could be that these suites are very, very heavy on, well, drumming. One reason why he may have added the fade into "Gary Owen" is to eliminate the long drum solo at the start of the recorded track. Based simply on what we have, he didn't seem interested at all in "Camp Duty" or "Drum Solos". In fact, when he needs more music for the loop, he goes over to Side B skipping "Camp Duty" entirely. Therefore, if the missing 2:40 is from the Eastman Wind Ensemble LP at all - and I'm not saying it is, because we'll never know, but if it is - then it's probably from Side B of the record in the "Traditional Music for Fife and Drums" suite. And it just so happens that the next three tracks on the LP following "The Breakfast Call", which he used, happen to work out to about two minutes and 33 seconds - "The Dinner Call", "Wrecker's Daughter Quickstep", and "Hell on the Wabash". This would fit in with his modus operandi elsewhere in the loop of simply working down the LP more or less in disc order. The final song in the "Fife and Drums" suite - Downfall of Paris - is a length which would require combination with either an edited track or more material of an unknown origin to hit the required 2 minute 40 second window, which of course is not outside the realm of possibility. 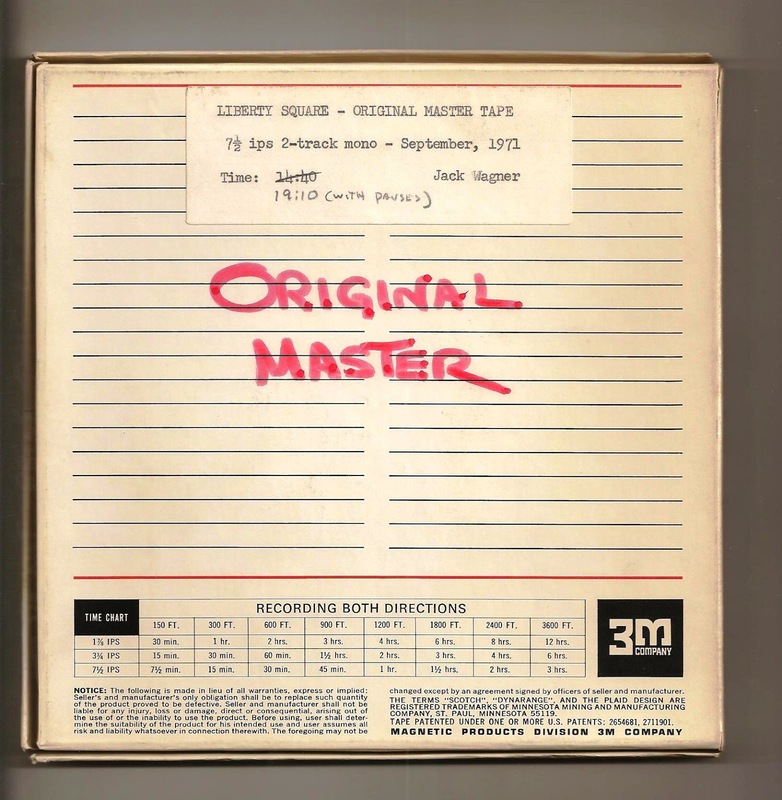 An additional wrinkle on the Master Copy is Jack's handwritten note: "19:10 with Pauses". This means there was apparently sections of the BGM loop which had no music recorded in them! As it happens, this 1971 loop used to circulate on the internet broken up into three files: what I've got listed above as Tracks 01-03 was once file one, Tracks 04-10 was file two, and Tracks 11-13 in a third. Sometimes they're presented in other orders, as on Utilidors' copy, but those three groupings remain consistent. Notice that the first two groupings come from Eastman Wind Ensemble and the third from the as-of-yet unidentified second source. It seems unlikely to me that whoever broke them into pieces did not do so for no reason. I think they broke them up into pieces to get rid of long gaps between the songs. In fact, I swear I remember downloading this piece of music online in the early 2000s and being baffled that it was filled with long pauses between the fife and drum music. I deleted it, convinced it was a mistake. Now I'm not so sure and I wish I had kept that copy. So we know that the track is intended to have 14 minutes 40 seconds of music in a loop which is 19 minutes 10 seconds long, which is a difference of 4 minutes 30 seconds. And if we combine this with my guesses above that the missing 2:40 comes from the Eastman Wind Ensemble LP, and that the missing Eastman tracks would have been all grouped together possibly in LP playlist order, we have a fourth "suite" of tracks which is missing from our version of the 1971 BGM. 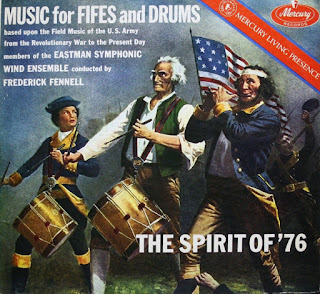 That's four distinct "suites" of fife and drum music, three contributed by the same "Spirit of 76" LP, and one from an unknown source. I doubt Jack would have begun or ended any BGM loop with a long gap of silence, that leaves three spaces between "suites" where the silence would have been. Please remember, this is nothing but a pure guess. But if I'm right, then the final group of three tracks could have been physically truncated off the reel at some point before Mike Cozart got it transferred to digital - such damage being more likely to occur at the end of the reel than the start or the middle - and then later on somebody else removed the long gaps of no music between the songs. So why would there be gaps anyway, and what's with the strange fades? Why is this loop so weird? I think that what Jack had in mind was a bit different from theme park BGM as we know it today. We're accustomed to a constant, gentle musical accompaniment inside theme parks, often in continual hour-long cycles. No such conventions could have informed Jack's choices in 1971 since he was inventing the style as he went. I think what he was going for here was the impression that a fife and drum band could be playing, perhaps just around the next corner. The fades in and out could represent the approach or retreat of another group of minute men. Let's also not lose sight of the fact that just because Jack was paid to create this loop doesn't mean it was widely heard in the way theme park music is today. As demonstrated elsewhere on this blog, in the 70s the Magic Kingdom sound system was patchy, and wild. You probably couldn't hear most of the music in the park unless you were inside or right under a speaker. Perhaps this only played from a few speakers near the entrance of the land, or only immediately around the Hall of Presidents. We'll probably never know for sure. But, yes, we can confidently say that the 1971 Liberty Square music is authentic, even if it only survives today in weirdly incomplete form.